I've did the character sketch for this a long time ago and finally decided to make something substantial out of it. 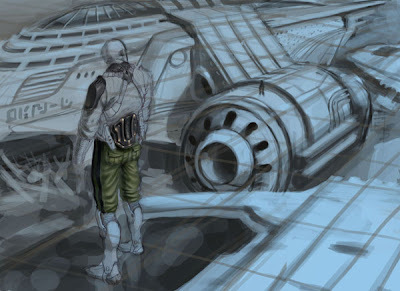 The basic idea is that the main character and his colleague are searching through ruined spacecraft in a junkyard. Not sure what they're searching for really, so don't ask :P.
At this point, I've blocked in the composition and main structure of the piece, and am now going into tighter detail. Granted, I probably shouldn't be noodling with the character so hard before the environment, but layers allow me to do it the dumb way. Check it out. This bad boy's got some potential brother hehe. I had some problems figuring out depth/height at first because there's not much shading detail in the background yet. Obviously the size difference helped out hehe. I am certainly curious about the backstory behind this scene, and also couldn't help but think it would be even more dramatic if there were many people pouring out of the ship down there that he's found... Either way man, good start! Keep goin! This is going to epic! I don't know if it was intentional to leave out the horizon line, but I think it could really ground the ship. Can't wait to see your next update!